Known as the “Umbrella Movement,” the 2014 Hong Kong protests for democracy have captured the world’s attention, not least for the participation of Christians. This talk will trace this Christian democratic tradition to the rise of an evangelical tradition in Hong Kong, emphasizing the separation of churches and the colonial state, and the trans-Pacific dimensions of Hong Kong’s evangelical tradition. 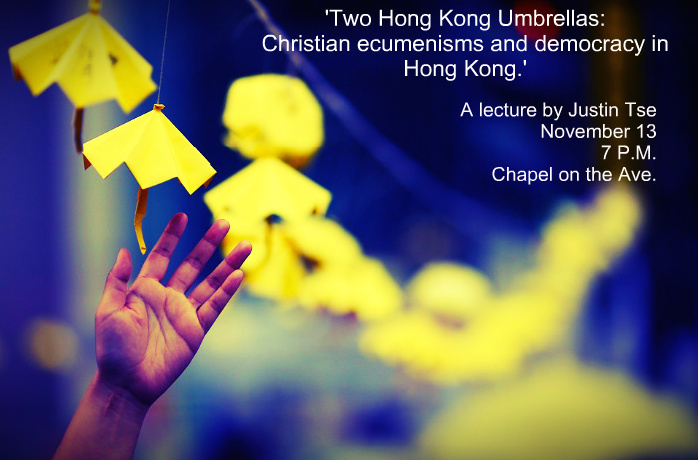 This lecture will be of interest to those who want to know why Christians in Vancouver should care about Hong Kong. We had quite the turnout. Room 100, a standard lecture classroom, packed out. The motley crew appeared to include first-generation Chinese Christian leaders, second-generation pastors, and a diverse crowd of Regent College students. It was – for all intents and purposes – fun! Regent College did make a recording, and the Cantonese-speaking Omni News also covered the event for that day. We will put a link to the recording here when it is available. I want to thank everyone who came out on what could have been their lunch hour. Specific thanks go to Regent Bookstore’s Bill Reimer and Regent College VP Patti Towler and Dean Jeff Greenman, as well as Trish Pattenden for organizing and advertising, and Rick Smith and Joe Lee for helping with audiovisual equipment. My hope is that this talk was informative for all who attended and will be useful going forward for Regent College in engaging Asian Canadian and trans-Pacific communities in their endeavour to put an ecumenical flavour of evangelical graduate education to work on the Pacific Rim. UPDATE: This lecture received full reporting from Ian Young at the South China Morning Post. I’m grateful to Ian for attending and for reporting so generously. Speaking at this event felt like a moment of completeness for me. 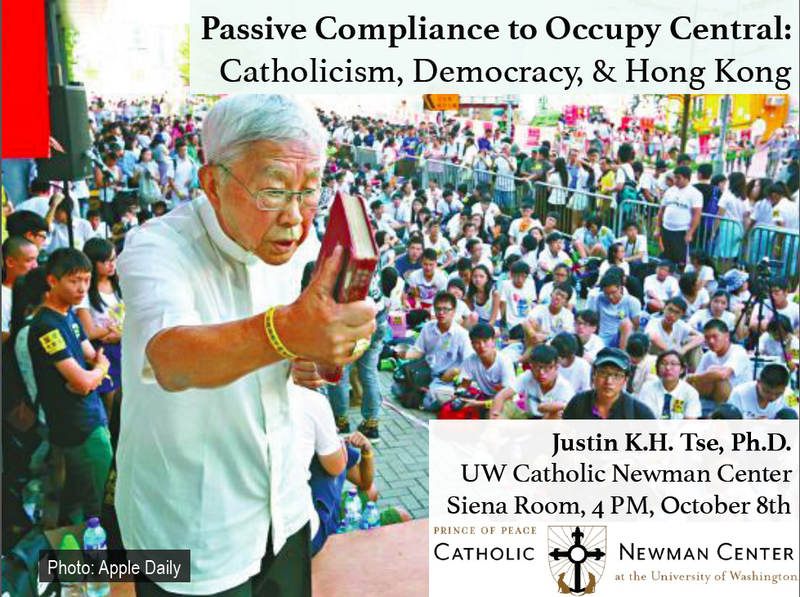 Previously, I had spoken in a Catholic setting at the UW Catholic Newman Center and at a secular academic talk for the Jackson School at the UW. 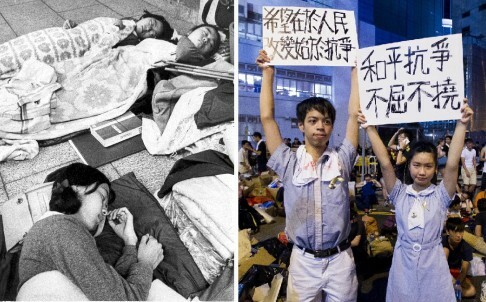 For the Catholic talk, I focused on the Catholic elements of the Hong Kong protests, and for the secular talk, I focused on the geopolitical imaginaries from Tiananmen that produced the sorts of grounded theologies we see emerging in the Umbrella Movement. Here at this talk hosted by InterVarsity, I zeroed in especially on the Protestants who were forming new ecumenisms, both with the state and among the grassroots people. The talk was very well-received. While the Catholics asked about Catholics and the Jackson School audience focused their questions on China, this InterVarsity public asked much more about how the Umbrella Movement could be used to think about church-state relations in America. The discussion was very rich and included references to immigration politics, war and anti-war activisms, indigenous politics (with a shout-out to Suey Park and Killjoy Prophets), and African American and Asian American racial politics, including at Ferguson. One even asked about the connections between Martin Luther King, Jr. and the Umbrella Movement – there are many parallels to be explored there! I also got to tell the story about how UW’s Comparative Religion Unit was founded by a lawsuit. I came away from this talk very encouraged about how my thinking on the Umbrella Movement is being received among various theological publics. I’m coming to appreciate how each of these publics contributes to our kaleidoscope of theologies here at the UW. Thanks, Geoffrey and Ashley Van Dragt, for your hospitality (as always! ), and thanks to the attendees of the Graduate Christian Fellowship for making this such a welcoming space for fruitful thinking on how the Umbrella Movement matters to more than Hong Kong. 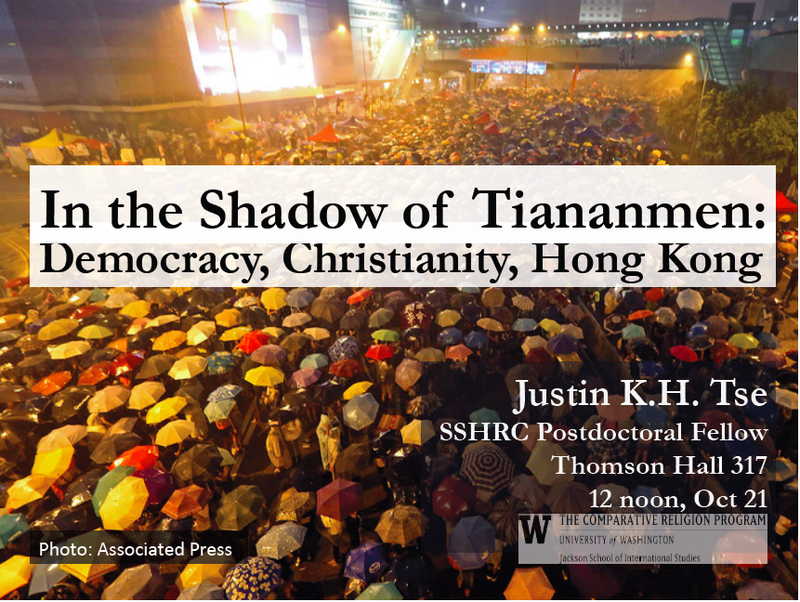 The talk was about how ‘the shadow of Tiananmen’ generates what I call ‘grounded theologies‘ in Hong Kong. My concerns were about Hong Kong, not China, in light of the Umbrella Movement. The talk was not about the Umbrella Movement per se, but was a deep 35-year history of local democratic movements in Hong Kong and Christian involvements in them. I’m thankful for James Wellman and Loryn Paxton, who organized the talk. I’m also grateful for all the constructive comments I received and for the UW Daily‘s fairly accurate coverage of my remarks.